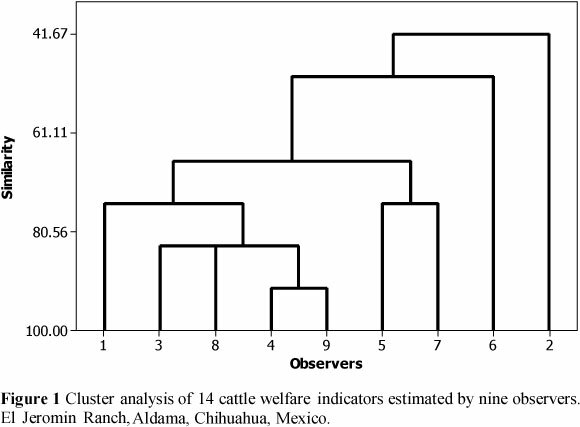 A cattle welfare index was estimated through 14 visual indicators in the cow-calf system in northern Mexico. The study was carried out at 25 ranches in Chihuahua, Mexico. The indicators were rangeland forage availability; rangeland plant diversity; ease of walking owing to terrain slope; ease of walking owing to presence of rocks; water availability; water distribution; water distance; water appearance; heat protection through vegetation; cold protection through vegetation; cold protection through topography; cold protection through management; cattle docility and cattle body condition. A score of 1 to 4 was given to each indicator, rated as poor, fair, good and excellent, respectively. 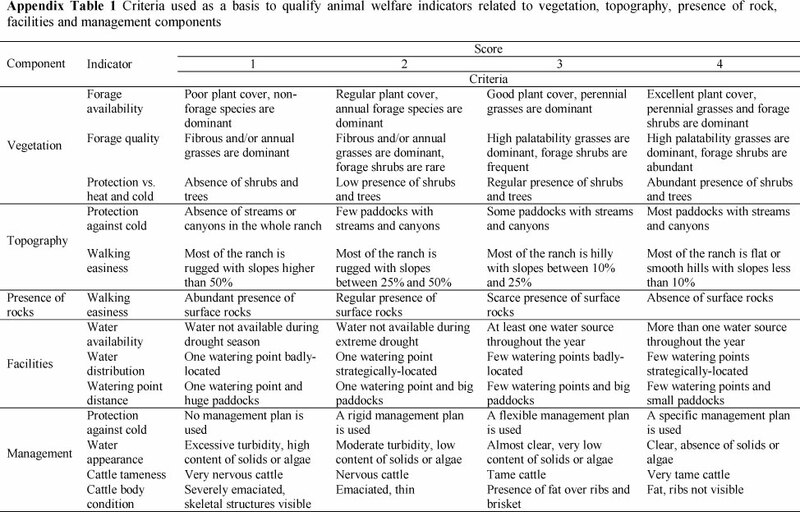 Ranches under study were classified according to their dominant vegetation type. Noticeable differences were obtained among animal welfare indexes, depending on rangeland type. The lowest index of 2.82 was recorded for the desert shrublands, while indexes above 3.0 were observed for the shortgrass prairie and oak-bunchgrass rangelands. Indicators with high values were water availability and distribution. The lower cattle welfare scores were related to natural factors rather than to management indicators. Livestock producers are facing the need to regulate their processes according to new consumer concerns such as natural resources sustainability and animal welfare. This is true for some emerging production systems such as "organic" and "grass beef, which are based on ecological principles and good cattle health (Lund & Rocklinsberg, 2001; Cachiarelli, 2006; Schnettler et al., 2008; Rinehart, 2011). Beyond market demands, animal welfare concerns should follow deeper reasoning, such as recognizing that animals have the right to live healthily and comfortably. Nevertheless, the beef industry is still lacking on this matter. Modern production processes are designed to maximize productivity and profitability, without considering basic animal health and welfare needs (D'Silva, 2006; Thompson, 2009). Whether motivated by humanitarian incentives or not, animal welfare is an issue that has been studied widely around the world since the last decade. Von Borell & Sorensen (2004) indicated that open spaces without overcrowding are good cattle welfare indicators. Llavallol (2006) pointed out that there is no precise definition of cattle welfare, and it is therefore recommended that animals do not go through stress factors such as hunger, thirst, malnutrition, fear, anxiety, physical and thermal suffering, pain, diseases and injuries. Giraudo & Raviolo (2007) stated that animal welfare is reached with appropriate facilities to carry out sanitary and management tasks, to minimize thermal stress, provide shade and fresh water, and reduce stress during animal loading and transportation. Global Animal Partnership (2010) proposed a way to evaluate the life quality of farm animals through the implementation of a five-step animal welfare rating system. This system requires that animals should spend their entire life on the same farm without suffering physical alterations, enjoying pasture-based feeding, enhanced outdoor access, and enriched environment, without cages, crates or crowding. The Royal Society for the Prevention of Cruelty to Animals (RSPCA) (2010) reported animal welfare standards that indicate that livestock must be free from hunger, thirst, physical discomfort, pain, injuries, diseases, fear and stress, so that they can behave normally. Grandin (2010) suggested a methodology based on five aspects: management stress, body condition, feet injuries, health and thermal stress indicators, while Mazurek et al. (2010) developed an animal welfare index consisting of 33 indicators that is grouped into five categories: locomotion, social interaction, flooring, environment, and stockmanship, as well as three indicators related to farm size. On the other hand, animal welfare in the cow-calf system in northern México has not been studied. In the state of Chihuahua, the cattle industry exports approximately 0.5 million head of cattle per year to the USA. However, rangelands on which this industry is based show high degradation (Royo et al., 2008) and other problems such as a possible closing of the USA market owing to tuberculosis and low profitability (Martinez, 2003). In this context, the traditional beef cattle production system of northern México should change to a new strategy based on sustainable management of natural resources, generation of aggregate value and good practices of cattle health care in order to reach better market alternatives (Espinoza et al., 2007). Some innovative Mexican cattlemen are making significant efforts to improve cattle management issues such as balanced feeding, water facilities and disease control. Those cattlemen demand rapid and reliable methodologies to evaluate animal welfare in order to make better decisions. Therefore, the objective was to develop and validate a methodology to determine beef cattle welfare status in the cow-calf system, based on 14 visually estimated indicators related to natural resources availability and cattle management. The study was carried out on 25 beef cattle ranches with cow-calf operations, located in six counties in Chihuahua, Mexico. The ranch owners belong to the Ganaderos Amigos de Parral cattlemen association. Cow-calf is the main beef cattle production system in northern Mexico, where most of the weaned calves are exported to the USA. Under this system, cattle graze in the rangeland throughout the year, and go from three to six days annually through in corrals for veterinary and other management purposes. The cow-calf ranches in the study area show diverse topography and landscape, varying from valleys to hills. The climate of the region is temperate-semi-arid, with ambient temperatures from -12 to 32 °C, and a mean annual rainfall from 300 to 450 mm. The dominant rangeland type is oak-bunchgrass (Quercus-Bouteloua-Muhlenbergia) on seven ranches, shortgrass prairie (Bouteloua-Aristida) on eight ranches, and desert shrubland (Larrea-Prosopis-Hilaria-Sporobolus) on 10 ranches, according to COTECOCA (1978), a federal agency for animal-carrying capacity assessment. Cattle welfare was determined by calculating an index consisting of 14 visually estimated indicators: 1) rangeland forage availability; 2) rangeland plant diversity; 3) ease of walking related to terrain slope; 4) ease of walking related to the presence of rocks on the ground; 5) water availability; 6) water distribution; 7) water distance; 8) water physical appearance; 9) heat protection through shade provided by vegetation; 10) cold protection through vegetation; 11) cold protection through topography; 12) cold protection through management; 13) cattle docility; and 14) cattle body condition. A score of one to four was given to each indicator, equivalent to poor, fair, good, and excellent, respectively. Body condition was first qualified using a one to nine scale (Herd & Sport, 1986). Later, this value was transformed to a one to four scale with the following arrangements (1.0 to 2.5 = 1; 2.6 to 4 = 2; 4.1 to 5.5 = 3; >5.6 = 4). Body condition and docility observations were estimated only in cows. The total number of cows observed was 2956, ranging from 10 to 265 in the smallest ranches and the biggest, respectively. Docility was estimated in terms of how close the observer could get to the cows. Therefore, a tame animal would let the observer come close to it, while a very nervous animal would run away from the observer. The animal welfare index was the average of all indicators, giving equal importance to each indicator. The criteria used to qualify these indicators are shown in Appendix Table 1. To reduce variation in criteria interpretation, all indicators in the 25 ranches were evaluated by one observer. Additionally, range condition was determined through relative plant cover sampling according to the climax theory (Dyksterhuis, 1949). Plant cover was determined through a step-point sampling technique at six to eight 400 m transects per ranch and 200 observations per transect. Additional data such as ranch sizes, paddock numbers, stocking rates, calving rates and weaning weights were collected by interviewing the ranch owner or manager. All data were collected from March to April 2011 in the dry season. A descriptive data analysis was done based on a stratified sampling arrangement, where rangeland type was regarded as strata. Variable means among rangeland type were compared with a limit of the estimation error at 0.05 probability level (Scheaffer et al., 1987). To validate objectivity of the criteria, an evaluation of a desert grassland ranch was performed by nine observers. The observers were experienced range management specialists, and estimated the same 14 indicators on this site. To avoid influencing the observers, only a short explanation of the objective of the essay and the way in which to fill out the form were given to observers. In other words, no training was given to them before this essay. Once the evaluation had been done, data were tabulated to build an indicator and observer matrix. Standard errors of the mean were calculated, assuming that differences within a specific indicator data were due to individual interpretations. Then, a cluster analysis was performed to generate a dendrogram showing similarity among observers. 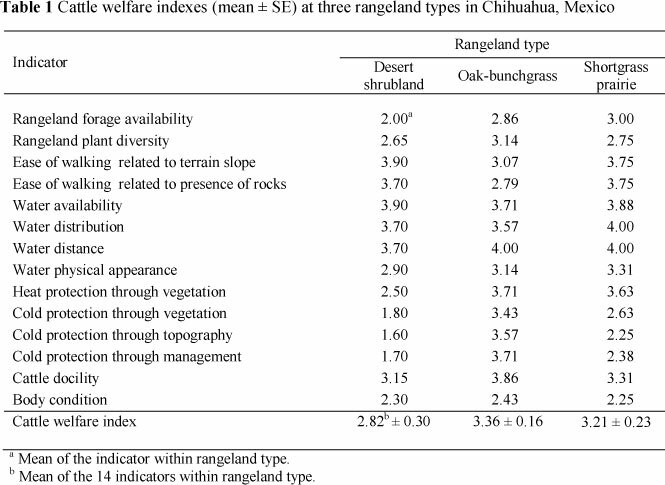 Noticeable differences were observed among animal welfare indices, depending on rangeland type of the ranches (Table 1). 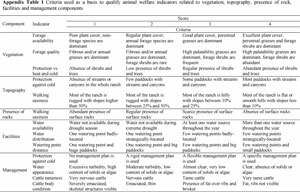 A low animal welfare index of 2.82 was recorded in the desert shrubland, while the index was above 3.0 in shortgrass prairie and oak-bunchgrass rangelands. Indicators with higher values were those related to water availability and distribution, since there was more than one water source in the latter ranches, such as ponds, water troughs, perennial streams and springs. Paddock size within the 25 ranches (Table 2) ranged from 97 ha to 151 ha, which favours water distance and distribution. An interesting indicator is cattle docility. It can be seen that its value relates directly to the cattle welfare index, implying that higher values on welfare indicators might be inversely related to cattle stress. Body condition scores varied from 2.25 to 2.43, and did not show any relation to cattle welfare in any of the rangeland types. Similarly, calving rates and weaning weights (Table 2) were independent of the vegetation type and range condition. As expected, higher forage availability must be related to higher performance indicators. In this case, the lower forage availability in the desert shrublands could be compensated by a more diverse diet in comparison with the grass-based diet in the other vegetation types, given that range botanical composition is one of the main factors affecting nutritive value of cattle diet under grazing conditions (Abusuwar & Ahmed, 2010; Roukos et al., 2010; Murillo et al, 2011). Other indicators with high scores in the desert shrubland ranches were ease of walking related to low terrain slope and low presence of rocks which favours movement and grazing activities. According to Osuji (1974), cattle spend 10 times more energy when walking on high slope terrains than on a flat topography. Under those terms, a higher ease of walking relates to better animal welfare because the animals have less difficulty in feeding and watering. With respect to the presence of rocks, this factor implies an obstacle in walking and grazing, although no research reports were found. On the other hand, heat protection with vegetation, topography and cattle management received low scores in these ranches. Most desert shrubland ranches showed flat to gently sloping topography where tall bushes and trees are scarce. Under these conditions, cattle cannot protect themselves against hot and cold weather, which are important factors in animal welfare, behaviour and productivity (Sprinkle & Holloway, 2000; Keren & Olson, 2006). The dominant breeds of cattle in the study sites are Bos taurus. According to Gaughan et al. (2010), these breeds are less tolerant to extreme weather conditions, mainly heat and relative humidity, than Bos indicus. Under extreme environmental conditions, these breeds also show some detrimental physiological effects, such as an increase of rectal temperature and respiration rate (Burrow & Prayaga, 2004). Rovira & Velazco (2010) found that providing artificial or natural shade during summer reduces the respiration rate of grazing steers without affecting grazing time or animal performance. Conversely, Goncalves et al. (2001) concluded that shade availability affects grazing, rumination and idling behaviour of cattle. Therefore, cattle welfare will be better when animals are well protected against adverse weather conditions, and their productive performance will probably increase. Ranches with oak-bunchgrass rangelands have high indicator scores regarding water availability and distribution. As expected in these rangelands, forage availability received high scores because of a high grass cover. Also, indicators were high when cattle were protected from extreme temperatures, owing to hilly topography and the presence of tall vegetation such as oak and other trees. Ranches with shortgrass prairie rangelands obtained homogeneous scores for all indicators. However, adverse conditions were observed in these ranches, since a low species diversity and plain topography offer low protection to animals against cold and hot weather, compared with other vegetation types. Table 3 presents the condition and stocking rates at three rangeland types in Chihuahua. Plant cover and range condition were related to rangeland types. In the desert shrubland ranches, desirable plant cover was 25.9%, resulting in a fair range condition. Desirable plant cover was 50.9% and 45.5% in the oak-bunchgrass and shortgrass prairie rangelands, resulting in good and fair condition, respectively. According to COTECOCA (1978), all ranches evaluated in this study showed stocking rates above recommendations (Table 3). Table 4 shows scores given by the nine observers for all cattle welfare indicators. Standard error of the mean can be qualified as acceptable, indicating a high degree of objectivity of the criteria used to assign the scores. Likewise, mean error standard of the cattle welfare indicator is low since it comes from a mean of the indicator means. Also, it is evident that evaluation is more homogeneous in extreme scores (one and four) than in intermediate scores (two and three). 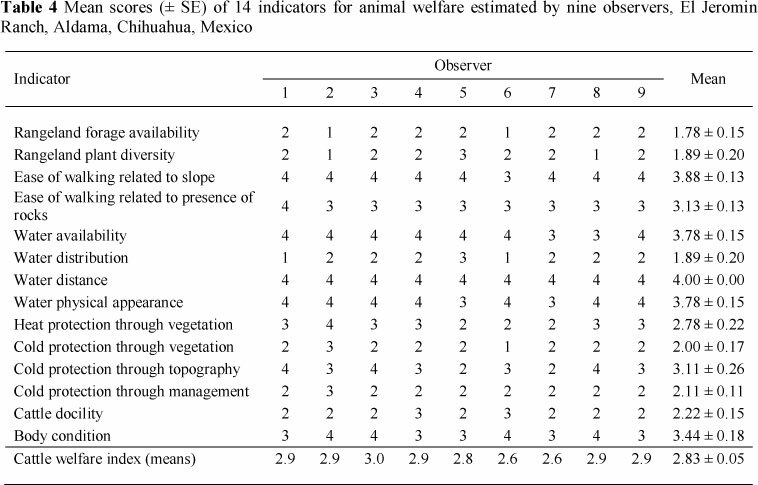 Figure 1 shows clusters of the observers, according to their scores on cattle welfare indicators. It is observed that seven of the nine observers formed one cluster under a similarity index of 67%. This index means that seven observers gave equal scores to the indicators. In this context, it is suggested that objectivity and reliability of the proposed methodology could still be improved by training the observers. Cattle welfare index varied from good to excellent in all evaluated ranches. Lower cattle welfare scores were related to natural factors rather than to management indicators. Objectivity of the qualification criteria used to estimate cattle welfare indicators was acceptable. Methodology developed in this study is a proposed technique for beef cattle welfare evaluation under range grazing conditions. It is desirable to validate this technique by including m animal-based indicators, further than docility and body condition estimations. Improvement of animal welfare is the base for transformation of the traditional cow-calf production system into a more ecologically, friendly and sustainable system. The authors want express their gratitude to Fundacion Produce Chihuahua, A.C., for its financial support. Also, to the Ganaderos Amigos de Parral Association for allowing us access to their ranches.